Abbiamo ricevuto diverse segnalazioni su questo cache poichè il proprietario permette fotolog e/o log fasulli. Questo non è consentito dalle Linee Guida. Il proprietario non sembra essere interessato a fare alcuna manutenzione sul questo cache che non risulta essere più presente. We got different info about this cache because the owner allows photologs and/or fake logs. This is not permitted by the Listing Guidelines. The owner seems to be not interested in taking any maintenance action on the cache that has been reported missing. The Spanish Steps (Scalinata della Trinità dei Monti) are a set of steps in the center of Rome, climbing a steep slope between the Piazza di Spagna at the base and Piazza Trinità dei Monti, dominated by the church of Trinità dei Monti. The Scalinata is the longest and widest staircase in Europe. The monumental stairway consisting of 138 steps was built with French diplomat Étienne Gueffier’s bequeathed funds of 20.000 scudi in 1723–1725, linking the Bourbon Spanish Embassy to the Holy See, today still located in Palazzo Monaldeschi at the piazza below, with the Trinità dei Monti above. Nowadays during Christmas time a nineteenth century crib is displayed on the first landing of the staircase. During May, parts of the steps are covered with pots of azaleas (then the cache rating has to be increased at least half a point!). In modern times the Spanish Steps have also included a small cut-flower market. The steps are not the right place for having a picnic (being forbidden by Roman urban regulations), but they are usually crowded with people from all over the world. 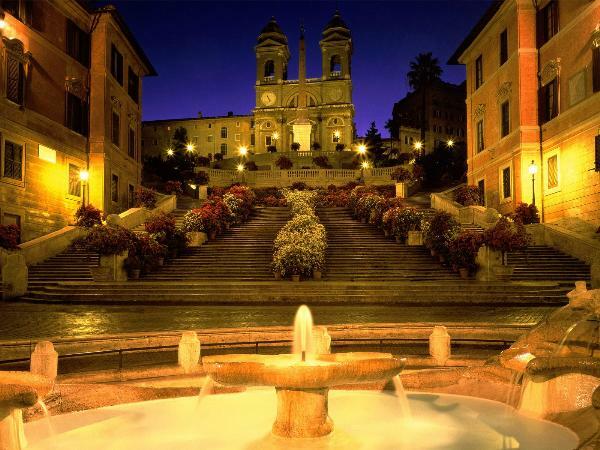 Therefore remember that the steps are one of the most visited places in Rome. MUGGLE-ALARM all the day! So please turn into STEALTH MODE and especially please prevent being watched by one of the ROSESELLERS/VENDOR-MUGGLES! We have to suppose that these guys are responsible for the multiple cache's disappearance in the past. Please bring your own pen! Special thanks to our local owner-partner bigmolla, who is doing all the maintenance work for us "at the steps" in a very perfect way!